Even as Egyptians celebrated the Id-ul-Fitr holiday that marks the end of Ramadan yesterday, their country is on a political knife-edge. With little sign of a rapprochement between the military-backed government and the supporters of former President Mohammed Morsi, the prospect of violent conflict inches inexorably closer. Not only have internationally brokered talks broken down, with each side blaming the other for their failure. The government is talking in ever more bullish terms about clearing the two, huge camps of pro-Morsi protesters in Cairo. `The decision to clear the sit-ins is final and irreversible,’ the interim prime minister, Hazem el-Beblawi said on Wednesday. The holy month of Ramadan had forced some restraint but it ended on Wednesday night. Once the three days of Eid are also concluded, hostilities may yet resume, bringing with them the risk that Egypt descends into the open conflict that has threatened ever since the country’s democratically elected — albeit unpopular — president was ousted in a coup last month. 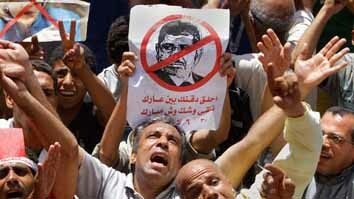 That the two previous, unsuccessful attempts to remove Morsi supporters from the streets saw the shooting dead of more than 130 protesters by security forces — the worst violence since the fall of Hosni Mubarak two years ago — hardly bodes well. It is difficult to be optimistic about a country so bitterly divided. Neither the EU’s Baroness Ashton nor the delegation from the US State Department (backed up by two senators) made any progress. But the fact remains that the only viable solution is a diplomatic one. The alternative is a very real risk that the region’s most populous country, poster child of the Arab Spring, descends into civil conflict. Hopeful or not, we must keep on trying.